What Style of Window Coverings is Best for Your Media, PA Home? It can be a fun experience to choose the right window coverings for your home in Media, PA! Have you been reading about the different design options and features that you might pick for your windows? It is a good idea to inform yourself about the options that are available in today’s marketplace. One of the fastest ways to learn about current window products is by talking with an experienced team. At Blinds and Drapery Showroom, we are experts in the window coverings industry. We want to make it easy for our customers to learn more about the different products that are available. As a result, we are always working hard to educate our customers and improve communication. If you want to improve the appearance of your home drastically, you may want to consider the benefits of installing window shutters. These products are designed to offer both elegance and functionality built into one system. Shutters are more expensive than other types of window coverings, but they are an easy way to improve the value of your property. In our showroom, you will have the opportunity to see both interior and plantation shutters. There are a variety of products and materials that can be used to match the shutters to the décor in your home. For example, you can choose the type of wood and color that will blend well with the other finishes on the outside and inside of your home. One of the benefits of choosing shutters is that they are stylish and timeless. You don’t need to worry about shutters going out of style because they will look good for many years. These products offer one of the most affordable ways to cover your windows. Blinds can be made using a variety of materials, which can have a direct impact on the cost of the product. At the same time, certain styles of blinds offer the perfect way to improve the appearance of the home. 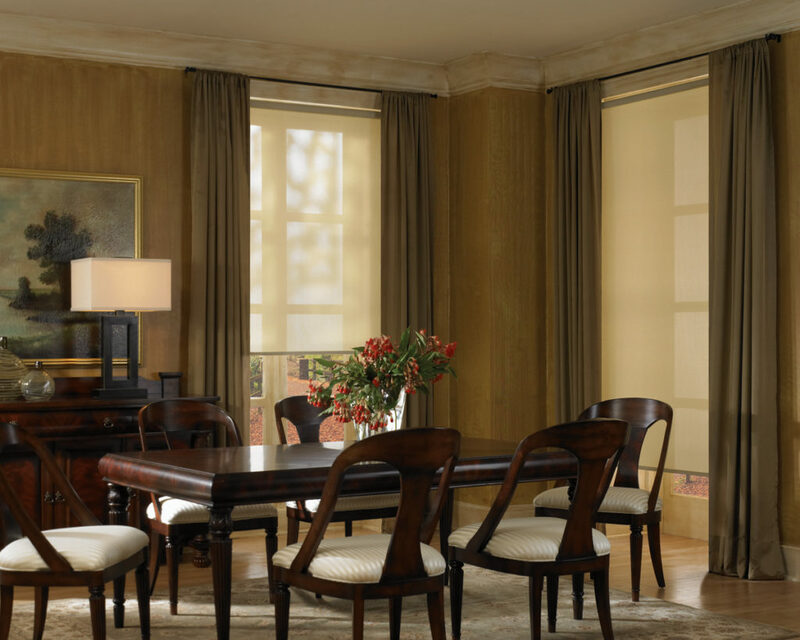 When you are picking your blinds, you can choose the size, color, and features of the product. For example, you might choose wide slats because you prefer that design style over the cheaper thin-slat products. Blinds are usually made using long horizontal or vertical slats. When the slats are pulled closed, they provide full coverage over the window. Most of the time the blinds are attached to the top of the window, and they can be lifted or lowered over the window. Common materials for blinds include metal, plastic, or wood. The system is built with a cord located on the side of the unit. This cord can be pulled or adjusted to move the blinds if you want to open or close the window. Window shutters and blinds use slats, but shades use fabric as a covering for the windows. There are different design features that can be used for shades, such as rolling or pleated fabric. With a rolling shade, the fabric spins around the rod when the shade is opened or closed. In comparison, pleated fabric gathers at the top of the window in stacks when the shades are opened. One of the biggest benefits of choosing window shades is that there is a wide range of fabrics and designs for you to consider. These products are both functional and decorative, offering an affordable way to improve the appearance of your home. You might consider a contemporary print to add a splash of color, or a neutral fabric if you want to maintain a simple and sleek design. Match the fabric to the color scheme in your home for the best results. Now that you know more about the different types of window coverings, are you ready to get started? It is important that you choose a contractor that offers high-quality products and excellent customer service. You are spending money to improve the appearance of your home. You deserve to get the best value for the money that you spend! At Blinds and Drapery Showroom, we have worked hard to build a solid reputation in the window coverings industry. Our team is always focused on customer service, giving you the option to get name-brand products at prices that you will love. These products offer more than just basic coverings for your windows. By choosing the right design style, you can upgrade the appearance of your home. Our custom-made solutions offer an easy way for you to create the home of your dreams.